Twice a month, our writer cooks from the book and decides if these farm-to-table recipes are worth the investment. 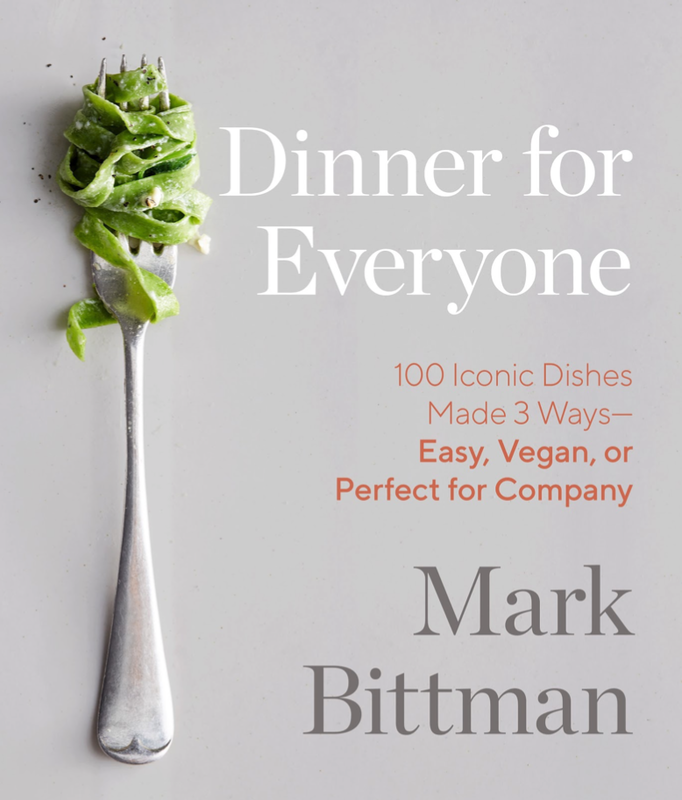 The cover of Mark Bittman’s latest book claims “100 Iconic Dishes Made 3 Ways — Easy, Vegan or Perfect for Company.” I took that to mean 100 recipes, each with three variations, but I was wrong. Dinner for Everyone (Clarkson Potter/Publishers, $40) is actually 100 themes played out in three (very) different recipes. Choose a dish genre (chowder, baked pasta, Indian curry, pot pie) and decide whether you want something “easy,” “vegan” or “all out.” Easy recipes are typically on the table in 30 minutes or with minimum hands-on time and won’t use all the bowls in your kitchen. Vegan options are plant-based versions “inspired” by the classics. And all out recipes are for when you have lots of time and someone to impress. One quibble is that there’s only one photo per theme, and it’s not necessarily placed next to the corresponding recipe. I flipped to the cacciatore section and considered my options: Drumstick Cacciatore (Easy), Hearty Vegetable Cacciatore (Vegan) and Rabbit Cacciatore (All Out). I decided on the drumstick version, which lived up to its “easy” designation. Drumsticks are seared, joined in the pan by garlic and button mushrooms and simmered with a sauce of tomato paste, balsamic vinegar, dried herbs, chili flakes and water. Next time, I might dial back the vinegar a touch, but served with a chunk of sauce-sopping sourdough bread, this made a simple and speedy supper. The value of this book really depends on whether you would use all three recipe styles. It doesn’t really work for vegans because of the 200 recipes they’ll never touch, and likewise anyone who shies away from entertaining. But if you’re the sort of person who says “I feel like cassoulet” and then thinks about whether you might want a quick, vegan or fancy version, perhaps it’s worth the investment. 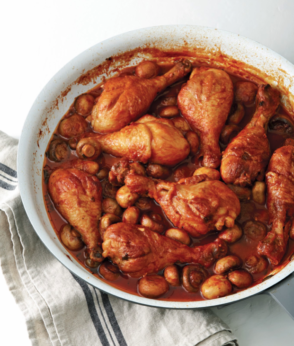 Excerpted from Dinner for Everyone by Mark Bittman. Copyright © 2019 by Mark Bittman. Published in the United States by Clarkson Potter/Publishers, an imprint of the Crown Publishing Group, a division of Penguin Random House LLC, New York. Reproduced by arrangement with the Publisher. All rights reserved. Put the oil in a large skillet over medium heat. When it’s hot, add the chicken and sprinkle with salt and pepper. Adjust the heat so it sizzles without burning, and cook, undisturbed, until it’s browned and releases easily from the pan, 5 to 8 minutes. Meanwhile, make the sauce. Put the tomato paste and vinegar in a medium bowl. Add 1½ cups water, the sage, red chile flakes, and a sprinkle of salt and pepper. Whisk with a fork until smooth. Turn the chicken when it’s browned on one side and releases easily, after about 5 minutes. Scatter the mushrooms and garlic onto the hot fat. Pour the sauce over the chicken and vegetables, then shake the pan once or twice to combine. Bring the mixture to a boil, then reduce the heat so it bubbles steadily without splattering. Cook uncovered, carefully shaking the pan a couple times more, until the chicken is just separating from the bone, about 20 minutes. Taste and adjust the seasoning, and serve. Use 1 tablespoon oil to grease a large roasting pan. Rip the bread into big pieces and pulse in the food processor until coarsely ground; put ½ cup breadcrumbs in a large bowl, reserve the rest (if any) for another use. Add the milk and let the mix- ture sit until the bread absorbs the liquid. Combine the ricotta, basil, and remaining 2 table- spoons parsley in a small bowl, and sprinkle with salt and pepper. Fold in the mozzarella. Taste and adjust the seasoning. Transfer the meat mixture to the prepared roasting pan, shape it into a ball, and use your fist to make a well in the top. Fill with the cheese mixture and mold the meat back into one seamless ball, enclosing the filling completely. Bake until an instant-read thermometer inserted into the meat reads 160°F and the filling reads at least 145°F, 60 to 70 minutes. Let the meatloaf sit for 10 to 15 minutes before slicing. 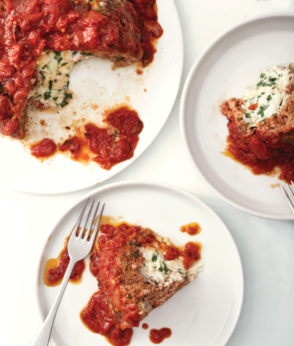 To serve, cut the meatloaf into wedges, ladle some sauce on top, garnish with parsley, and pass grated Parmesan at the table. Heat the oven to 400°F and position 2 racks toward the center with a few inches in between them. Line 2 rimmed baking sheets with foil and smear each with 1 tablespoon oil. Remove the stems from the mushrooms and save them for another use (like stock, opposite). Slice the caps crosswise as thin as you can manage. Put 2 tablespoons oil in a large skillet over medium-high heat. When it’s hot, add the onion and garlic. Cook, stirring often, until the onion softens, 3 to 5 minutes. Add the rice, lower the heat to medium, and stir until the rice is glossy, completely coated with oil, and starting to toast, 3 to 5 minutes. Sprinkle generously with salt and pepper, then add the apple cider. Cook, scraping any browned bits from the bottom of the pan, until the cider has mostly evaporated, just a minute or 2. Turn the heat down to low and add the stock and Brussels sprouts. Bring to boil, lower the heat to a steady, gentle bubble, stir once or twice, then cover. From this point, the rice will take about 40 minutes to become tender; check after 30 minutes to make sure there’s enough liquid and, if not, add about ¼ cup more. When the rice is tender, turn the heat to the absolute minimum (if you have an electric stove, turn the heat off and let the pan sit on the burner), and let rest, covered, for another 15 to 30 minutes. Add the remaining 2 tablespoons oil and the dill and fluff with a fork. Taste and adjust the seasoning, fluff again, garnish with the mushroom bits, and serve. Cut into chunks: 4 carrots, 2 onions (don’t bother to peel), 2 all-purpose potatoes, and 2 celery stalks. Put them in a pot with 5 or 6 garlic cloves, a good-sized bunch of parsley, 3 quarts water, and some salt and pepper. (Add tomatoes or fresh or dried mushrooms if you’d like.) Bring to a boil, then adjust the heat so the mixture bubbles gently. Cook until the vegetables are tender, about 30 minutes. Strain the stock through a fine-mesh sieve, pressing on the vegetables to extract as much liquid as possible. Discard the solids. Cool to room temperature, then refrigerate for up to 1 week or freeze for up to 6 months. Makes 2 quarts stock in 1 hour.